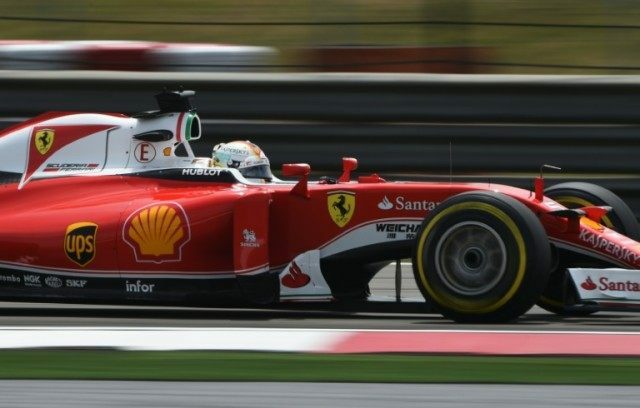 Shanghai (AFP) – Ferrari struck a psychological blow ahead of the Chinese Grand Prix as Kimi Raikkonen and Sebastian Vettel pipped the dominant Mercedes in Friday’s second free practice. Raikkonen blazed to a fastest lap of one minute, 36.896 seconds, edging out Vettel by 0.109, as Ferrari bared their teeth after some indifferent form in the season’s first two races. Nico Rosberg, who won in Australia and Bahrain, went third quickest in 1:37.133 after posting the fastest time in the morning, while world champion Lewis Hamilton was fourth in the Shanghai haze. Fernando Alonso, who fractured ribs after a terrifying crash in the season-opening race, was formally cleared to compete by medics after clocking the 12th-fastest time in the morning. The Spaniard inched up to 11th in the second session. Though lacking, perhaps, the drama of Friday practice 12 months ago, when a Chinese fan vaulted the pitlane wall and demanded to test drive a Ferrari, there were plenty of thrills in the morning with two red flags after a series of blown tyres. The jousting between Mercedes and Ferrari in the afternoon was no less absorbing, Rosberg and Hamilton flexing their muscles early on before Ferrari’s two former world champions put in their blistering qualifying simulation times on super-soft tyres. Four-time world champion Vettel placed third in last month’s Australian Grand Prix as Raikkonen’s engine caught fire, but in Bahrain it was Vettel’s turn as the German’s engine blew on the out lap. But on Friday’s form at least the omens look good for Ferrari, the most successful team in China with four victories — including the last of Michael Schumacher’s record 91 race wins 10 years ago. Mercedes for once didn’t have things all their own way, with Rosberg’s car suffering ignition problems and Hamilton, who has been hit with a five-place grid penalty for Sunday’s race after a gearbox change, twice spinning off at turn 11. “Something’s up, I keep having this locking into turn 11,” complained Hamilton after his second mishap at the hard-braking left turn. Felipe Massa set the tone for a bizarre morning by skidding off at turn four with a punctured left rear tyre — before astonishingly shredding another Pirelli on the same wheel. “Something is broke on the car,” the Brazilian observed with wry understatement, before Renault’s Kevin Magnussen limped back to the pits on ruined rubbers, also to his left rear. Williams technical head Pat Symonds blamed “wheel rim failure” for Massa’s issues.